John Middleton-Cox is originally from Northern New York. He attended the Crane School of Music and The Boston Conservatory. He studied voice with Sheila Fiumarello and Iride Pilla. As a classical tenor, John has performed various professional roles from Dr. Blind in Die Fledermaus to the Duke in Patience. Some of his favorite performing venues have been Jordan Hall, the Emerson Majestic, and The Old North Church. Mr. Middleton-Cox is an all-around musician. He has composed and produced an original musical, orchestrated for The Thayer Symphony orchestra, accompanied professional singers, and conducted professional pit orchestras. He has collaborated with Broadway Actor/Director Russell Garrett. He was featured in a Musical Theatre symposium at Berklee College of Music. 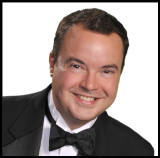 John has served as an adjudicator for the Mass Bay Music Festivals, Great East Music Festival, and the Massachusetts Music Educators District Chorus. Some of his proudest moments have been conducting his students at Fenway Park and bringing his students to perform at Carnegie Hall. John is The Performing Arts Director for the Burlington Public Schools and currently lives in North Andover where he is the Director of Music at the North Parish Unitarian Universalist Church.